Howdy. Today’s the day! The $100 Room Makeover challenge is complete. Welcome to our global eclectic master bedroom . Let’s do a quick recap.. We are in a traditional Japanese home in Iwakuni, Japan. The bedroom is small but has plenty of closet space and natural light. Here’s how it looked a month ago. The inspiration board I shared with my plans in the first week. I’ve been infusing global eclectic style throughout our home so I knew that I wanted to take that direction with our bedroom too. Goodbye boring walls and floors, now when you walk into the room you see my DIY basket wall art! I decided at the last minute to move the chair into our room from downstairs and I’m so glad I did. It looks perfect in the corner and helps balance the other side of the room. I found a solution for my husband’s side of the bed. The side table is so tiny, I opted for a pretty gold mercury lamp (IKEA) and a tall basket (Pier One) on the wall to fill the empty space. He has a little more surface for his glasses and water glass now. I moved the tall lamp that was on his side to my side. Its narrow base opened up more room on my desk turned vanity. I exchanged the pretty flower arrangement for a plant and leaned an extra DIY art piece in front of the mirror. We found the perfect solution for the tv (I shared a little peek last week.) This pretty cabinet is the right height and has beautiful carvings and colors on the drawer fronts. The garden window was tricky because I had planned on using most our budget for plants but it went towards the cabinet. 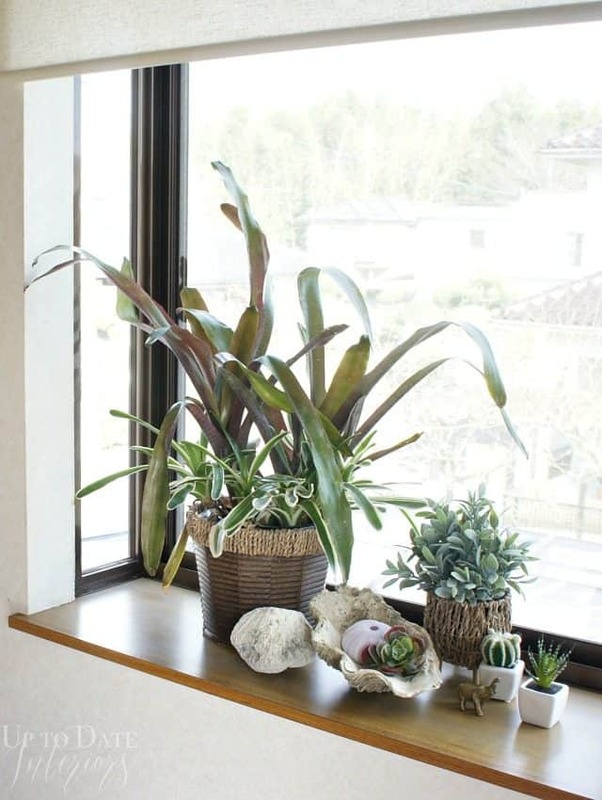 I was able to purchase one live plant (with a mix of plants in it) and group it with faux plants and shells I had around the house. I’m really happy with how everything came together. Not bad for only being in our rental for 2 months. I’m so looking forward to seeing all the reveals this week. Enjoy! This looks totally amazing. You have a great talent for creating the neatest spaces with tons of interest. What a sweet comment Marty! Thank you so much. it looks awesome, kathy! i LOVE your bed! SOOOOO dreamy! Your bedroom is beautiful. I love the way you mix and match texture with color and prints. It definitely lives up to your Global Eclectic title. And that cabinet! So great and worth the money. Great job. THe space is stunning. And the baskets on the wall at just amazing. I’ll take a bunch of those any day!!! You added so much character to this space. I absolutely love it!!! Thank you so much for participating in this challenge with me this month. It has been so fun to see how everyone decided to use their $100. Thanks Erin! This challenge is just what I needed to start getting into a groove in our new home (and city). Thank YOU!! I love how everything has come together! The colors work so well and all the global accents look amazing. It’s so cozy and fresh and makes me want a garden for my window too! This is modern, gorgeous and so cozy! All that natural light in your space is a dream, and I love how much you packed into the space without it feeling cramped. Wow, I love this Kathy! I LOVE that bed, and you really packed a lot of style and charm into that little bedroom! I still love those floor-to-ceiling cabinets…I love how your place maximizes space in a smaller footprint! Awesome job! Wow! Your room is amazing! I love all of the bright cheerful colors that you used. This is one of the most beautiful and fun bedrooms that I have seen! I love it! The basket wall art is so fun ! Wow! Thanks Amanda! It’s such an odd mix of things but we really enjoy it now! Oh wow it looks so amazing! I love this room. The lighting is so lovely and I love the way you styled it! Those baskets are so cool! You did so much and it looks amazing. I adore the basket wall! Pinned. Thank you Maureen! We are so happy with that little cabinet. It was a great (and unusual) find! Kathy – I always love your spaces, and this one doesn’t disappoint either! I love the mix of old and new – it’s so natural and elegant. Gorgeous job! Wow! What a difference! The basket above your husband’s night stand is perfect. And your view is amazing. I’m gathering plants for our master bedroom, and I really like what you did with yours. Great inspiration! The way you mixed textures and styles, so eclectic! Love the sitting corner, but hen again, I love everything about this room. Stunning!! Thank you so much Amy! Living abroad has definitely influenced my style. Incredible! I really love all you’ve done with this space and how you mix different styles and periods and textures and patterns together – it’s amazing how cohesive it all ends up being. Not everyone can do that successfully but you more than pulled it off.. Just LOVE it! What a compliment! Thank you Kim. This was such a fun challenge! It looks so welcoming and serene. Absolutely love your room makeover! Great job. Thank you so much! We are really enjoying it! The basket wall art above the nightstand is perfect!! I love how you have everything styled! Thank you!! Isn’t Daphne fabulous? I found her at a little antique store in NC. You did an amazing job, Kathy! I love the new look of your master bedroom! Where did you get that blue pillow from ? Is it mud cloth? Hmmm, maybe? I found the fabric at an import store, it’s very light weight. I bought yards of it for just a few dollars! Hi Kathy, wow congrats on the move to Japan. How exciting!!! I hope you are feeling at home ! Tiny bedroom but cozy! I love what you did, the capiz caught my eye! Where did you get it from? I see a different one in the list above than the one you have hanging (I think)? Christine from Little Brags! Hey Christine! We just love it here. We were two years in Okinawa but we moved to mainland Japan about a year ago. The capiz pendant my friend bought for me as a bday present. I’m pretty sure she snagged it from one of the military gift shops in Japan so I don’t have the resource for it. It’s not a light, just the shells!